Who owns a laptop here? Oh, well probably the person reading this article surely does. Well, how many of you own a good laptop backpack for easy carrying and transport? Probably, to this question, barely a few will have positive answers. This is because not every laptop backpack is good enough to hold your laptop and provide you with comfort at the same time. Laptop backpacks are basically dual shoulder strapped bags which are used to carry laptops in a relatively easy way. Mostly, these are used by travelers and business community may not be needing this as they prefer a briefcase for the purpose. The following review will tell you regarding the top 5 cheap laptop backpacks under $50 in 2018. 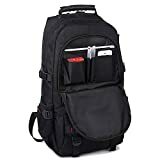 The AmazonBasics Backpack for Laptops is a great laptop backpack which can be used to carry 15.6 inches’ laptops or some even ultra slim ones which can range up to 17 inches. It has a large multi-compartment backpack with a padded sleeve for laptops. As it is a traveler bag as well, it has mesh water bottle pockets at sides as well. For people who want this bag for organizational and business purposes, there is a good news for them as well. This laptop backpack has compartments for pens, keys, and cell phone which will make you have everything in need at your office. The internal dimensions are 12″ x 4.5″ x 17.5″ (LxWxH) and the outer dimensions: 15″ x 7″ x 19″ (LxWxH). This backpack comes under $50 and is considered as one of the best bags by several thousand customers. 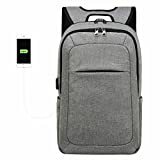 The best thing about having this backpack is the fact that AmazonBasics offers a 1-Year Limited Warranty with this backpack so that you have no worries or tensions in mind while buying it. Outer dimensions: 15″ x 7″ x 19″ (LxWxH). As we all have an idea that the company SwissGear is also a great one for all the types of bags, backpacks, and other storage bags as well. The SwissGear SA1908 Black TSA Friendly ScanSmart Laptop Computer Backpack is one of the best bags you can get for a nominal price. The unique thing about this backpack is the fact that it unfolds to flat position keeping above and below the laptop sections clear. Also, it has an adjustable padded laptop straps inside to fit different size laptops so that you don’t feel that your laptop is constantly shifting places which lead to weight diversion as well. It can accommodate the majority of the laptops which have a screen size of almost 17 inches. The best part about having this backpack is the fact that it gives you ultra-high comfort as it has a multi-panel airflow design provides extra padding for comfort and maximum back support. The organizer pocket is also there for all your pens, pencils, phones, and other stationary equipment. The Kopack Slim Business Laptop Backpacks is also a nice and smooth bag. The unique thing about having this bag is the fact that it has a water-repellent design due to Nylon Fabric used. Obviously, you are going on a travel and there is absolutely no idea of the weather. In that case, such backpacks seem to be the best choice as they increase the safety and protect your laptop as well. Its dual-access zipper with anti-theft design allows for easy access and increases safety. Being available in two colors such as Black or Light gray, this backpack has an optimum capacity of holding a 13-14 inch laptops and can also handle most 15.6-inch slim notebooks. The exact size of the bag is expected to be11.8″ x 7.1″ x 17.7″. Also, it has a Multi-compartment laptop backpack equipped with one large packing compartment, separate laptop compartment, tablet holder, and front pocket organizer. Which other company would be giving you so much for under a price tag of $50. Well, we are sure many of them wouldn’t. To provide additional comfort, there are padded shoulder straps and back padding which offer extra back support and comfort. The top loop handle is also present which help in securing a perfect grip. On number four we have a 100% Brand New backpack which is the KAKA Terylene Fabric Backpack for 17-Inch Laptops. It has the capacity to hold the majority of the laptops which are under 17 inches. You can not only use it as a backpack but can also use it as a tote bag because there is a handle on the top. It’s not easy to get this bag wet as it has a water resistant lining. Also, the integrated breathable mesh pad in the back will provide you with great comfort and give a rest to your back. There are several pockets inside it which can be used to carry various small items as well. The best part about KAKA is the fact that the company gives a 1-year warranty so you can contact them for any problem and they will respond. It is highly recommended not to wash it with hot water or alkaline detergent. Instead, wash separately and dry separately for the best results. It is also available in 4 different colors of Black, blue, gray, and camo. The Mancro Business Water Resistant Polyester Laptop Backpack is a great backpack which is again designed to hold the majority of laptops which come under screen size of 17 inches. Its dimensions are 20 x 12.2 x 5.7 inches. Basically, it has 3 main pockets and 9 internal pockets and 2 sealed side pockets which mean you can put anything in this backpack and there won’t be any mess ever. Also, the unique thing about this one is the fact that it has an external USB with built-in charging cable. It also includes a theft proof Combination Lock & Durable Metal Zippers for maximum security and comfort as well. It has a lifetime warranty and is available in several colors like Gray, black, coffee, purple, and dark indigo. Get the best cheap laptop backpacks under $50 by buying one of the above. Also, comment regarding your experience to guide others.